It’s been a while since I took part in a challenge. I liked participating as it gave me new ideas and forced me to really look at colours or designs. But then I won… And I felt it wasn’t fair to keep playing if others haven’t won once yet. I like others to have a chance as well.But it’s been a while and I still see all the artwork from the DTs of my favourite sites. I came across a challenging colour combination – the green seemed too bright to combine with the rest. But it did have a rusty metalness too it as well. 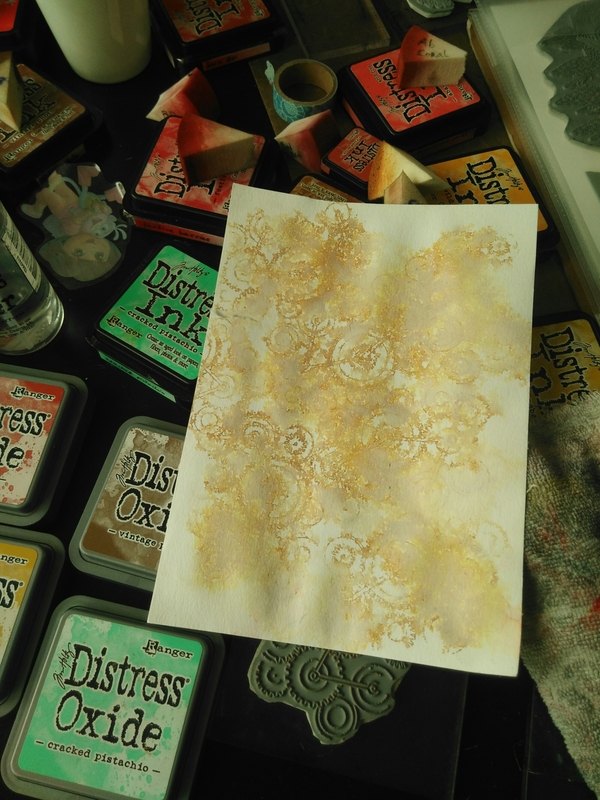 Hmmm… Ideas… And the colours did match my new distress oxide inks as well. Lots of pictures incoming. I loved making this card, took me three evenings. ( that is 2 times 3 1/2 hrs and 20 minutes to add text and mount it) (and at least 3 hrs I was watching television and only crafting during commercials… That’s what happens when crafting with the television on). So actual craft time excluding drying time? No idea. It was fun. Loved the card at every step, fearing I’d ruin it the next step. So the colours. Steampunk. Eastern. Eastern steampunk. Ancient, mystery. Dreams. Stamped the image several times with vintage photo distress oxides. My 4 1/2 year old having fun with stencils. Half has dried. Helping my daughter while it’s drying. (Or rather, prevent everything being covered in ink). She didn’t like what I did to it. Mommy, I don’t think it’s pretty this way. I liked it better before. Really, mommy! The colours that are going to be used. Steampunk butterfly – I used the cogs, and the rounded ornament. Textured Fragments – The window is also one of my favourites. Stamped that with distress oxide, also the three warm colours.Sprayed with water. This image should be a bit more clear but I like it when the colour also comes from the lines. Used the colours as pictured. Cat wants attention while I’m stamping. I colour on the stamp with ecoline brushpens and then stamp. Add a little bit of distress oxide to the stamp and then stamp. Add a little bit of water with a water brush and stamp. 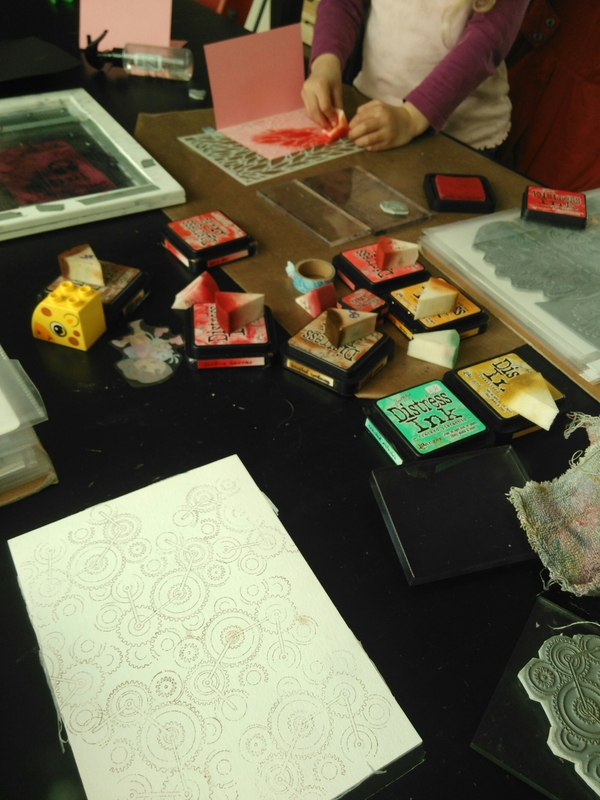 Next, clean your stamp (don’t move it from the stamping tool!) and stamp with embossing ink, then heat emboss with clear powder. Colour it using a dry brush on distress oxide ink, distress markers and a water brush. Cut the stamp also a bit better as it leaves lines – I got the stamp before I got the good sciccors to cut them and didn’t dare to cut closer with the regular scissors. Added glossy accents to the eye and waterfall stickles to the feathers. Also added spectrum noir clear sparkle pen to the butterfly at some point. Also have coloured the device in the background. coloured the device. First time I used Cracked Pistachio, the 4th colour, on this card. The card wasn’t balanced, it needed something in the upper right corner. The cherry blossom from Tranquility matched very well. I stamped onto self adhesive transparant window foil twice and cut it out. (The other mask is attached to the other side of the folder the stamps are in). (You can see I have a mask for the buddha as well). 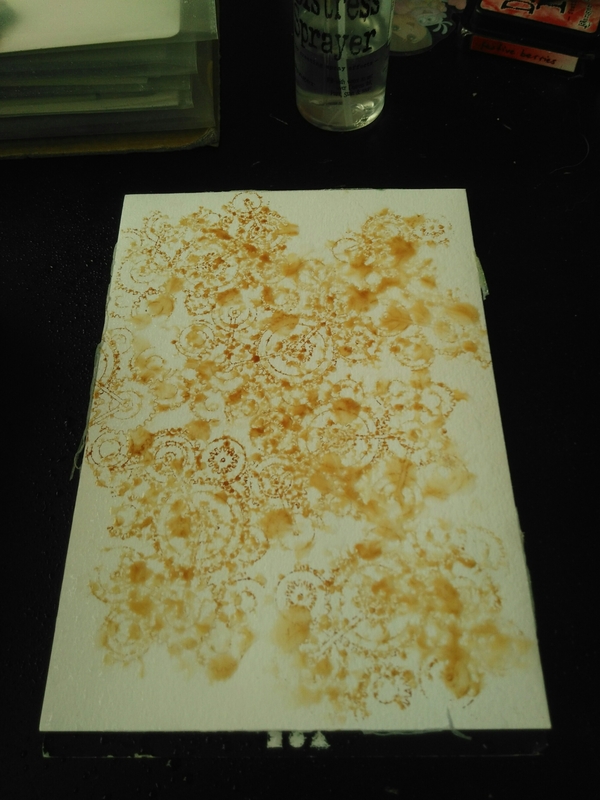 I stamped several times with red and brown (not sure if it was oxides or stazon or both). Blossoms colourd, positioning the peacock now. The text was stamped with sepia Versafine. Thank you, Chocolate Baroque, for hosting this challenge – wouldn’t have made this card without it! I haven’t played the game much – bioshock – but I like the graphic style. (Ofcourse, it’s a fps and a bit horror themed so it’s dark and aged. Dismiss the horror-elements and it’s a beautiful nautical steampunk forgotten city style, very athmosperic. Or so it seems from memory. Let’s see if I can find images…) The game is based on a book which I haven’t read. Maybe I should do that one day. … allrighty, memory is better then the images I find. Let’s just stick to Nautical Steampunk then. I made these last year as well, posted them allready a while ago on facebook but not on my blog if I am correct. I do like these cards, I love how well the metal/rusty effect has turned out! To make this kind of metallic background: grab some crayons in contrasting colours, scratch them on the surface and then ink up. The ink doesn’t take on the crayons. Next I spritzed some water over it for more rusted effect. 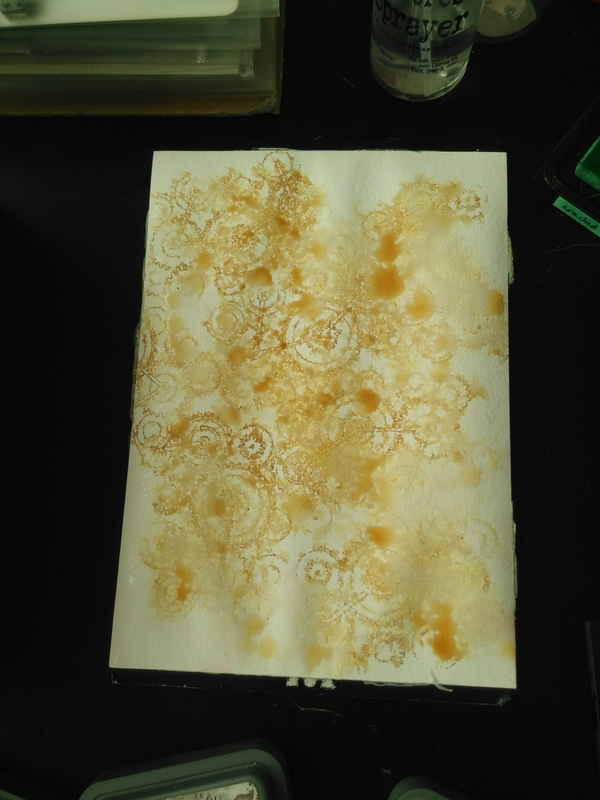 When doing this crayon resist technique on an embossed form, leave the paper in the embossing folder as your rub the raised parts. Then ink up. 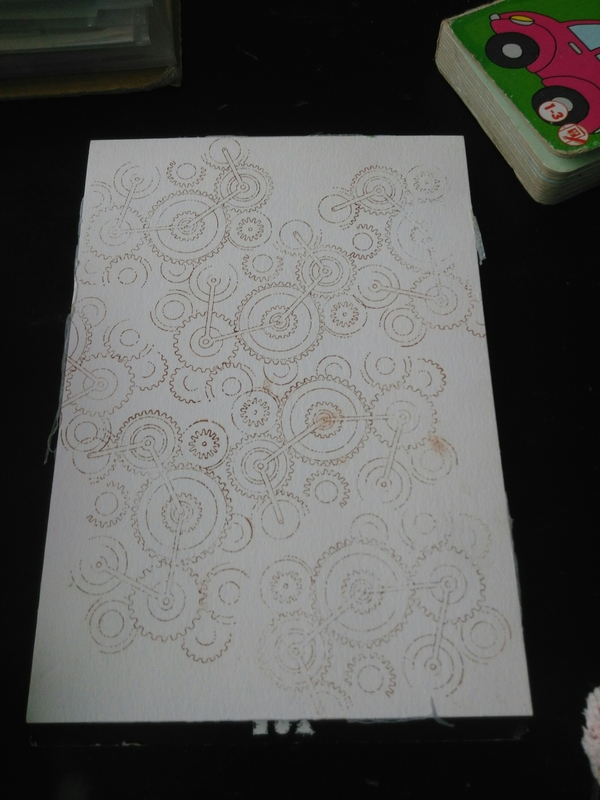 I had also placed a stencil (wheels) on this paper before embossing it or using crayons. It would have been better without. An oldie, made about a year ago but never got around to posting it. As I have commented somewhere yesterday that I hardly read blog or post on my blog due to timerestraints, I have to contradict myself now and do a posting spree. I’ve still got quite some finished and not entirely finished waiting in my “ready to upload” folder on the pc. Flower are from a Chocolate Baroque steampunk set. Metal flower card – very pleased with the results! See how glossy and jummy the flowers look? Glossy accents, stickles, glossy accents. Some of the used materials. This looks nice, I prefer the smooth surface. Experimenting with aluminium foil and alcohol inks. embossed with an embossing folder. Not sure what I expected. embossed as well, don’t quite like it, the effect of the alcohol inks is less visible. Effect is ok (wiped the alcohol ink from the raised bits ofcourse), but I found it still very shiny. I loved making these rustic frame! See what I mean with shiny? A birthday card for an 11 year old boy – what to make? Chocolate Baroque has stamps for that occasion as well, the steampunk sea set is very suitable for boys (of any age). A few posts ago I wrote about the technique with kitchen foil, paint and spray, and at that time I made also a blue background with this technique, as you can see here. I didn’t put two pieces of cardstock together for this one though. The colours were chosen from the Chocolate Baroque colour challenge #9. This is my first entry for the challenge. (Yup, the ocotopus is going to be another one but that one isn’t ready yet and I might have ruined the scene a bit. I think it looks good the way it is here, not sure if what I did was an improvement. Ah well, not this post. All colours are incorporated in the background. The fishes are mostly pearly lila colour, together with some watery blue. Some more blue in the seahorse, and bundled sage on the letters. Somehow Shaded Lilac and Milled Lavender are difficult for me to recognize, I keep picking the wrong one, they seem to be the same but when I look at the ink lids they are quite different. I think I did use shaded lilac on the letters though. First letter is a steampunk stamp set from Vivalasvegastamps, the other letters and banner are sizzix thinlits dies (tattered banners and some medieval alphabet I think). It’s matted onto white card of which I pianted the edge blue. First the scans, as the colours are better looking on them. The first is a bird in on the ground in a cornfield, made with stencils from TCW and stamps from Chocolate Baroque and 1 Dutch text clearstamp: “zomaar” meaning: without reason, literally translated. A card wihgoout a specific purpose, not for a birthday, but just because it can. With this in mind I browsed through my collection of stamps. Isn’t a brewster perfect for these colours? Brown and red, with corn and straw colours on the ground, green in the back. For the green background I also used a Chocolate Baroque stamp, or several actually. I konw you can hardly see it but the green was a bit too harsh green. The other one is a bit darker, but with the same colours. Mixing the brown and read a bit more on the gear. This card is a bit plain, it lacks something. A little bit of glossy accents on the eyes maybe, or (I notice now) metal colourd screws. A little sneak peak also on birdcard number 3 – with the fired brick colour in mind I ofcourse had to use bricks as well! The card I made for my partner, who had his birthday 13 days after our son was born. I loved making it, and like the card whic is a bit of a mixed media metal foil canvas card. I started making it the evening before his birthday, and finished in the afternoon of his birthday – he was working. Let me show you the mess on my desk. Not unusual when I’m crafting, although lately it’s been less of a mess – less time, so using less different techniques. You can see the main part of the card is allready finished in this picture, and I’m working on a frame or background now. I used some leftovers for this project, and also made some new embellishments. The cogs, green/copper swirls were leftovers. Not sure if the heart and hinge were. The flower and keyhole are new. I used two embossing folders, first a metal plate one, polished lightly after embossing. Then a tools embossing folder, and polished after embossing too. Making very shiny and glossy pieces – cut out the heart and emboss (or the other way around), ink up, then spray with perfect pearls mist copper, and add glossy accents. The border with the hinges I thought of a bookcover or door, so had to make a door/cover frame ofcourse. I replaced the stencil, dabbed embossing ink on it, and heat embossed it with copper embossing powder. The idea was to have more blue shown through, but I had stamped the embossing ink too much. Loved how it turned out anyway! I especially loved the left part, so I tore it off and cut it in two pieces, and glued those further apart on a bigger piece of cardstock. I added some more ink to the edge. The main part later on hides the cut. Also quite new for me is playing with aluminium foil and alcohol inks (and add to that, embossing). 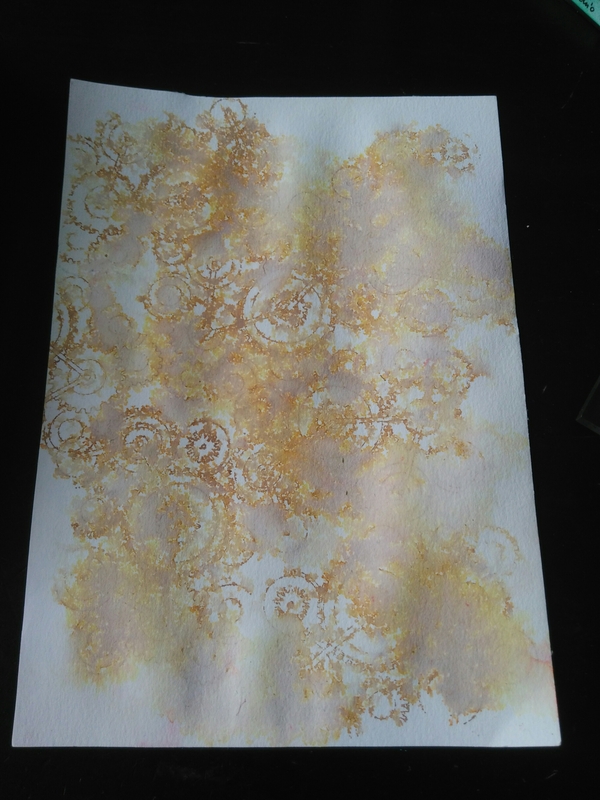 Ofcourse that wasn’t flawles, I found the aluminium foil still very shiny, it tore up a bit so you saw the card underneath, and I’m not good at using alcohol inks (yet). I bet having holes in the foil and using that foil adds an extra difficulty level to it ;). And in the grass, where you can see how it shines. The waves, fish and clouds should move when the wheels turn, only the chain for the clouds is missing. (How do the clouds stay up then? Uhhh…) Once the gears(cogs) are fixed, the clouds wiggle because of the end of the beam on the left side wich touches the gear. Or cog. Cogs(gears) are from my stash, diecut from a Papermania? Cogs(gears) die set, painted with turqoise and copper acryllic paint. The frame underneat the gears (cogs) is made with rusty hinge and perfect mist perfect copper spray. The screws are made with a Paperpen, and then when it was fairly dry, I put a real screwdriver in it. Sandee and Amelie Steampunk’s steampunk challenges – Steampunk Stories – I did tell myself lots of stories while making this. About how I could have REALLY made this work – get proper cogs, line it up, make things really move. That would be fun to do! But oooh the time… That clock… Anyway, I’d envisioned some kind of steampunk tinkerer making this protype, and maybe one day he’ll make a real working model.